So I finally picked the granite. We're going with the new venetian gold. Apparently, different places have different versions of each stone, and I finally got the samples from my granite place and it's definitely the one I like best. And here's the faucet I picked. It's from Ikea, although I did check Costco too, thanks for the idea Sarah! :-) If I hadn't found this one, I would have gotten the one from Costco. 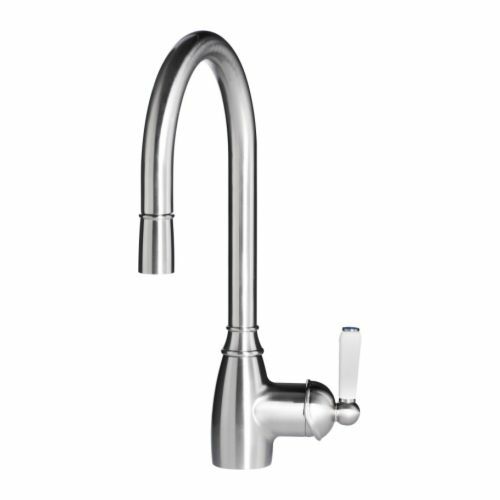 This one was only slightly more and I like the goose neck faucet the best. I finally found a sink! 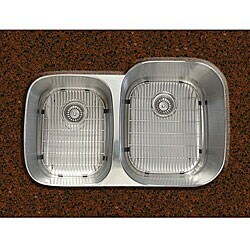 Thanks to a home remodel site a friend referred me to, I was able to find some websites for more inexpensive sinks. This kitchen project is totally on a budget, so I was really hesitant to pay $400 for a sink at home depot. Instead I found this little beauty on overstock.com. With shipping it was half the price of Home Depot. And, it's a nice sized sink, the smaller side is the same size as the basins in my double sink now. So, it will be nice to have a bigger sink on one side. The faucet will be offset a bit, the large side of the sink is going to take up most of my counter space. But I think I like that look. I'll let you know when it's all done. And here's the details in case I need them later. o Over $75 dollars in FREE products! I have my temporary kitchen all set up, and the real kitchen is almost empty. Some things still need to be packed away or put in their temporary home, but the pantry, the fridge and all the cupboards are empty. Wow. Your kitchen is going to look great! You are very brave, by the way. Kitchen remodels are not for the faint of heart. I can't wait to see the play-by-play. I like the double sinks too. It is amazing what you can find online!